I tell you what, I have been SO busy this week! Although, I guess I already mentioned that, huh? Well, today is the last Friday with my sweet kiddos. It is very bittersweet. On the one hand, I'm feeling excited that we've almost finished the year. But then I remember it's my last time having these wonderful children in my class. I love the personality mashup we have going on in here, and I'm really going to miss them next year. I've got a packed weekend ahead of me, too. Tonight we have JB's high school graduation. I saw him graduate from 8th grade, too, so it's neat to see this one as well. Saturday we've got a little "couples dinner" going on, with the girls from my usual Girls Dinner crew and their significant others. We're heading to Adobo, and if we stay long enough we might wrangle the guys into some salsa dancing! (Any of you boys actually reading this? Did I just foil our plot?) Finally Sunday I'm heading to Northwest Indiana for a bridal shower for my good friend Katie. Anyhoo, before I got to rambling, the purpose of this post is to invite you to join me in Courtney's June Yoga Challenge! Honestly, I've never been a huge yoga person. I've done it a few times, but I always find my mind wandering, which I'm pretty sure is the opposite of what's supposed to happen. Well, I decided that with summer and more time coming up, I could challenge myself to consistently incorporating yoga into my workouts. I know Jourdan is a huge fan, too. More encouragement to try, right? 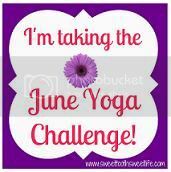 My goal: Include Yoga in my workouts 1-2 a week for the month of June. I may or may not get that second one in each week, but something is better than nothing, right? I'm going to take advantage of my gym's yoga sessions and/or the ones on demand on Netflix. I'll keep you posted on my progress, and I hope you do the same! Anyone care to join me?! Thanks for the tip! I will remember that!